Alternatively, the title could be, ‘A Lot of Snow’. My eleventh entry for ABS Builder challenge. 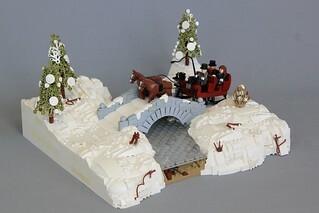 This build was basically two days of nearly non-stop building; one to build the bridge, sleigh, and water/underwater section, and one to make all of the snow and finishing details such as the trees. 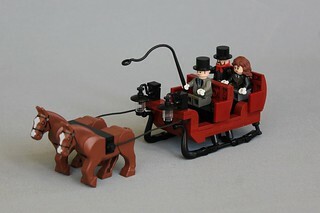 The dark red seed part is used 8 times in the sleigh. Just hear those sleigh bells jingling, ring-ting-tingling too. This is gorgeous. I hope you are able to keep this together as a decoration for next Christmas. Beautiful scene! 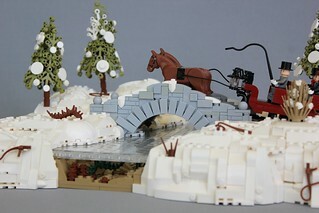 I love that water/underwater section, and the sleigh would make a perfect Christmas decoration. Those trees are fantastic, too. Wow. This is a most beautiful creation. Well done.